In teaching the hitting baseball tips and fundamentls to children or players, many coaches and parents find themselves dazed and confused over where to start. Yes, it can get very complicated if you let it. I'm going to simplify it so no matter your expertise in teaching hitting baseball tips and fundamentals, you'll be able to easily get the basics in place with your child or players. These fundamentals apply to all ages. However, as players advance into high school, college or pro ball they will experience more advanced hitting tips as the pitchers are much more capable of detecting hitters shortcomings. Note: The bat should not be squeezed tightly. 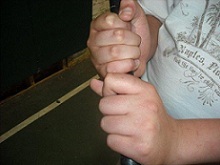 Hold on lose enough to keep your hand and finger muscles relaxed without losing control of the bat. 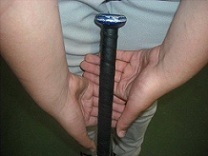 You'll see later how your grip will tighten slightly as your swing begins. IF YOU ARE LOOKING TO PURCHASE A BASEBALL BAT OR OTHER BASEBALL EQUIPMENT Click here for great prices on bats and other equipment. - Where to stand in the batters box. A good guide is to lay your bat accross the plate and align you feet as seen in the diagram. - Feet should be shoulder width or a little more apart. - Weight focused on the balls of your feet (not your heels) and toward the back foot until the swing begins. Serious about improving your bat speed and power? Click Here to access sport specific baseball training techniques designed to do just that! Training for all sports is also available. I'm going to make this as simple as possible. The baseball swing is as complicated as a golf swing in many ways. However, focusing on the youth player (12 and under) the key points of hitting baseball tips can be simplified and made easy to understand so both parents, coaches and players can all understand on the same level. - As the pitcher releases the ball, the batter's eyes should be focused on the baseball. Your eyes should remain on the baseball until it makes contact with your bat. - Also as the ball is released, the batter will begin their swing by taking a small step forward (not more than 6 inches) with their foot closest to the pitcher. Your weight will slowly begin to transfer from the back foot to even distribution as your weight will continue to transfer forward in the next steps. At this time your hips begin to drive open and face the pitcher as your weight continues to transfer to your front foot. - Your arms and hands extend out in front of your body. A common misconception is to extend them directly out from your body toward home plate (causes imbalance and power loss). The final step of the hitting baseball tips swing. Once you complete your bat extension with arms and hands out front, your top hand will roll-over top to finish your swing (also called the follow through). For right handed batters, this is your right hand. For left handed batters, this is your left hand. - your hands finishing high over your opposite (bottom hand) shoulder. Click on this highly recommended link for an Outstanding Assortment of Bats and other Equipment at GREAT PRICES!